What a wonderful year of work and achievements for the Centre! With this last 2017 edition of the Inclusive Growth Bulletin, we bring you a new issue of our flagship publication—the Policy in Focus magazine—dedicated to the theme of social protection in the Middle East and North Africa (MENA) region; a new study carrying out a comparative analysis of the effects of unemployment insurance savings accounts on the labour market; and a new publication series summarising the main debates from a recent seminar on climate change and national accounting. As we look forward to 2018, we would like to express our sincere gratitude to you, dear reader, and to the ongoing support of partner institutions, international organisations, and our global network of thousands of collaborators, experts, policymakers, academics, and friends. From all of us at the IPC-IG, happy holidays! 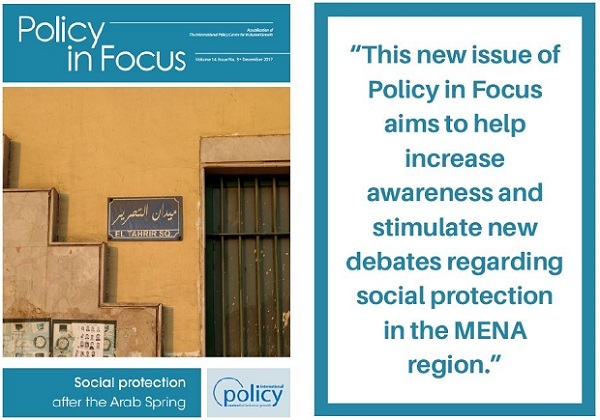 We are glad to bring you a new issue of our flagship publication—the Policy in Focus magazine: “Social Protection after the Arab Spring”. Featuring specialist guest editors Rafael Osorio and Fábio Veras (IPC-IG), this issue gathers 17 articles with diverse perspectives from leading scholars, researchers and practitioners to examine the current state of non-contributory social protection in the Middle East and North Africa (MENA) region as a whole and in specific countries, and explore how these countries have been coping with and learning from recent economic and humanitarian crises. Since achieving their independence, countries in the MENA region have assimilated or otherwise adapted formal social protection schemes established by former colonial powers, which have proven to be regressive and highly subsidised, and therefore unable to protect the poorest and most vulnerable segments of the population engaged in the informal sector or rural labour. Formal non-contributory social protection systems in the region are now are undergoing substantive reforms, aiming at phasing out subsidies, redirecting investments and improving targeting mechanisms. However, these reform efforts face three great challenges. First, the stunted economic growth in most MENA countries, triggered by the global economic crisis and falling oil prices. The second challenge is the combination of high food prices and unemployment, which leads to increased poverty and greater demand for the support of non-contributory social protection. The third challenge is the rise of conflicts in the region and their consequences, such as millions of internally displaced persons and refugees, which puts added strain on the already difficult task of supporting vulnerable nationals. In the Working Paper "The Brazilian Government Severance Indemnity Fund for Employees (FGTS) and unemployment insurance savings accounts in other countries: a comparative analysis of their effects on the labour market", Ana Luiza Neves de Holanda Barbosa and Miguel Nathan Foguel (Institute for Applied Economic Research—Ipea), and Charlotte Bilo (IPC-IG) assess the current structure of the FGTS and describe the Fund’s history and institutional framework. The authors then conduct a comparative analysis between the FGTS and unemployment individual savings accounts (UISAs) adopted in some other Latin American countries, and present the main results of the most recent empirical studies evaluating the impact of UISAs on labour market indicators. This publication is available in English, and an accompanying One Pager is available in English and in Portuguese. The One Pager “International experiences in climate change-related statistics” summarises a panel debate showing that the state-of-the-art for accounting in Brazil and around the world requires the integration of actors and information systems to meet a challenging new era, where people and economies will be evaluated according to their ability to diminish the human impacts of GHG emissions in the atmosphere. This publication is available in English and in Portuguese. Recapping the debate promoted by the eponymous panel, the One Pager “Brazilian environmental accounting initiatives” highlights that in a country of continental size and endowed with incredible environmental assets, such as Brazil, it is not immediately feasible to coordinate national and climate change accounts. The greatest challenge to this endeavour seems to be determining the methodology that will underpin the national accounting system to be adopted. This publication is also available in English and in Portuguese. Finally, the One Pager “Linking national emissions inventories to economic accounting” presents a discussion on how emissions reporting can be transformed into emissions accounts, and the challenges involved in the process. This publication is available in English and in Portuguese. We are very proud to share the Brazil Learning Initiative for a World without Poverty (WWP)'s Activity Report 2013-2017, which presents the achievements and vast knowledge production of the Initiative. The WWP is the result of a partnership established in 2013 between the Brazilian Ministry of Social Development, the IPC-IG, Ipea, and the World Bank. The report is available in English and in Portuguese, as well as in smartphone/tablet-friendly formats. The One Pager “Challenges and perspectives for rural women in Brazil under the 2030 Agenda for Sustainable Development”, by Amanda Barroso Lima, Beatriz Abreu dos Santos and Isadora Cardoso Vasconcelos (UNDP), is now available in French, Spanish and Swedish. It was previously released in English and in Portuguese. 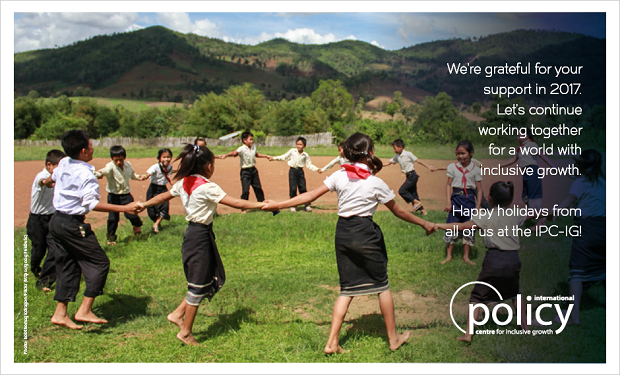 At the IPC-IG, we believe in the power of knowledge to change people's lives and the world. Part of the Centre’s mission is to produce evidence-based policy research, delivered through several different publication formats, ranging from the popular One Pagers to the flagship magazine, Policy in Focus, to the more technical Working Papers and Policy Research Briefs. All publications are made freely available online through the Centre’s website every month, and are announced in our monthly newsletter. In 2017, the Centre made available a total of 144 new publications, including three issues of Policy in Focus: “Social Protection: towards gender equality”; “Debating Graduation”, and the newly released “Social Protection after the Arab Spring”. Continuing the “Shock Responsive Social Protection” webinar series, our colleagues and partners at socialprotection.org will host the webinar "What role can social protection play in responding to humanitarian emergencies? Findings from a global study", on 11 January 2018. Organised by Oxford Policy Management (OPM), this webinar will present the global findings of the Shock-Responsive Social Protection Systems research—financed by the UK Department for International Development (DFID) and led by OPM, in collaboration with the Overseas Development Institute (ODI), the Cash Learning Partnership (CaLP) and the International Network for the Availability of Scientific Publications (INASP). Free registration for the webinar is available here. The overarching conceptual framework that informed this study was summarised in the IPC-IG One Pager “Conceptualising shock-responsive social protection”, by Valentina Barca (OPM). This publication is available in English, French, and Spanish. The IPC-IG research team undertook two complementary missions to Maputo and Chimoio, as part of three ongoing research projects with the World Food Programme (WFP) in Mozambique. 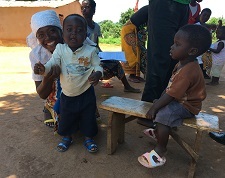 The first study consists of an impact evaluation of WFP's Social Behaviour Communication Change (SBCC) project to promote good health and nutrition practices in Manica province (read more about it here). The second project aims to assess the coverage of food fortification in the country, and the third project will assess the impact evaluation of a set of WFP interventions to facilitate market access for members of 14 smallholder farmers’ organisations. IPC-IG Research Associate Mario Gyoeri is on a mission to Chimoio—the capital of Manica province—until 22 December, to train the enumerators for the SBCC project's endline survey, supervise their activities in the field, and to conduct focus group discussions with SBCC beneficiaries. These discussions will form the basis of the qualitative research component of the evaluation. Research Associate Wesley Silva travelled to Maputo, from 23 November to 1 December, on a mission to design sampling plans for the three studies. During the mission, he analysed microdata from the 2007 Mozambique Census to construct a counterfactual region using a propensity score matching methodology and to work on the selection of enumeration areas for the SBCC study. The next edition of Inclusive Growth Bulletin will be released in February 2018, featuring news and publications of the two first months of next year. See you then!